I saw him, once, at a steel show in Florida, probably 20 years ago. That's a good example of Claude's playing on the Eharp tuning. It sounds a lot like C6 pedal steel guitar IMO. Many of the same chord voicings. Many years ago I heard a recording of Claude backing up a rockabilly singer. When he took his solo he sounded just like a 1950s rockabilly guitarist. I've searched the internet for that recording a couple of times since but I can't find it. It's probably lost to the ages. I'm with you Doug, I hear mostly C6th voicings. based on past posts by Claude and b0b that he tuned down a 4th, I'm assuming from bottom to top: Ab, B, C, Db, D, Eb, E, Gb, Ab, B. I haven't seen any indication that he changed the intervals but just tuned down a 4th. Many years ago I heard a recording of Claude backing up a rockabilly singer. When he took his solo he sounded just like a 1950s rockabilly guitarist. I've searched the internet for that recording a couple of times since but I can't find it. Do you remember the artist and song title? I can't remember, Mitch, unfortunately. I found it by doing a search for "Claude Brownell" about a dozen years ago. There was a link to the song on someone's web site. The singer/band was someone I never heard of. A couple of years later I tried to find it again and it was gone. Is that a standard guitar? I think that's the one, Mitch. It does sound like a standard guitar. So is Claude Brownell the singer on this record? Don't know. I'd guess so, just going by the label. However, I dug this out of the Stroudsburg PA newspaper from Nov 1, 1969. Apparently he had a group known as The Travelaires, along with his wife Patti. "Entertainment will be provided by The Travelaires, featuring Claude and Patti Brownell, two of the country's top country music performers. Brownell was formally the steel guitarist for Hawkshaw Hawkins, internationally known country music star." 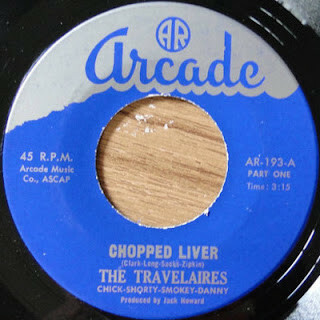 They backed several groups on the Arcade label out of Philly during the 1960s. See below. 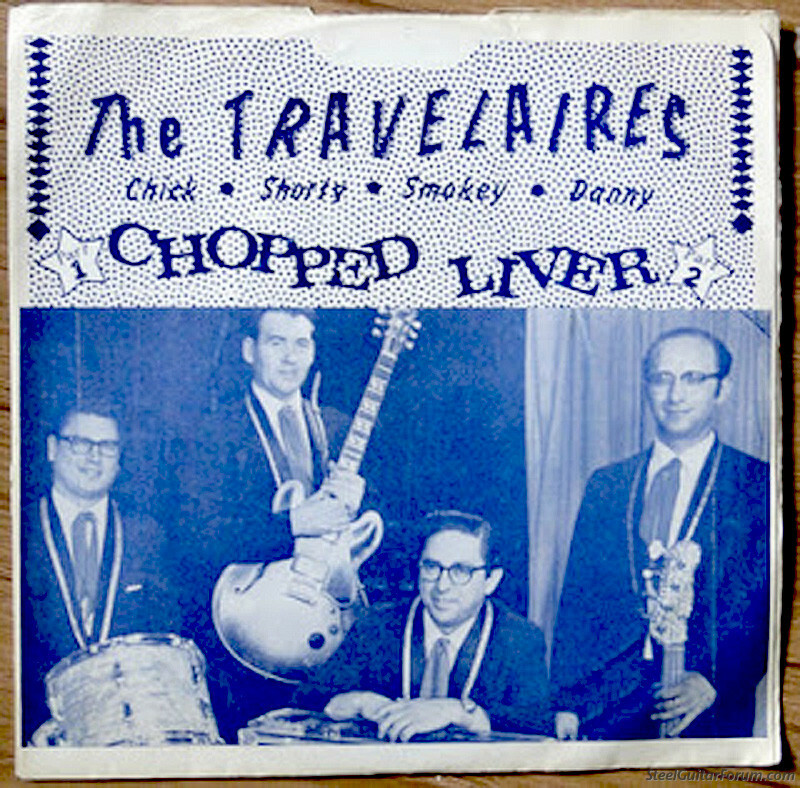 Notice in the pic of The Travelaires--the third guy from the left apparently is "Smokey". Looks like his arms are resting on a steel guitar. He looks like the Claude Brownell in the color pic farther up in this thread might have looked in the 1960s. Here's Hot Rod Daddy. Sounds like a steel to me. Claude Brownell & Travelaires - I Met Her in a Honky Tonk; label and details unknown. 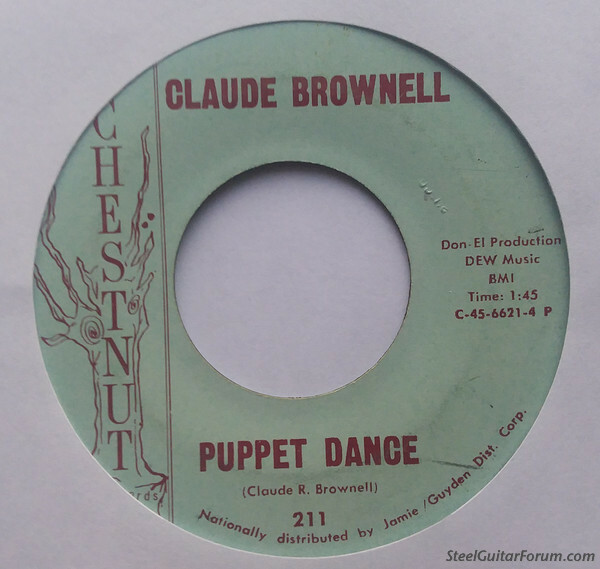 Claude Brownell: Hawaiian Honeymoon/Puppet Dance; Chestnut 211; supposedly from 1959. 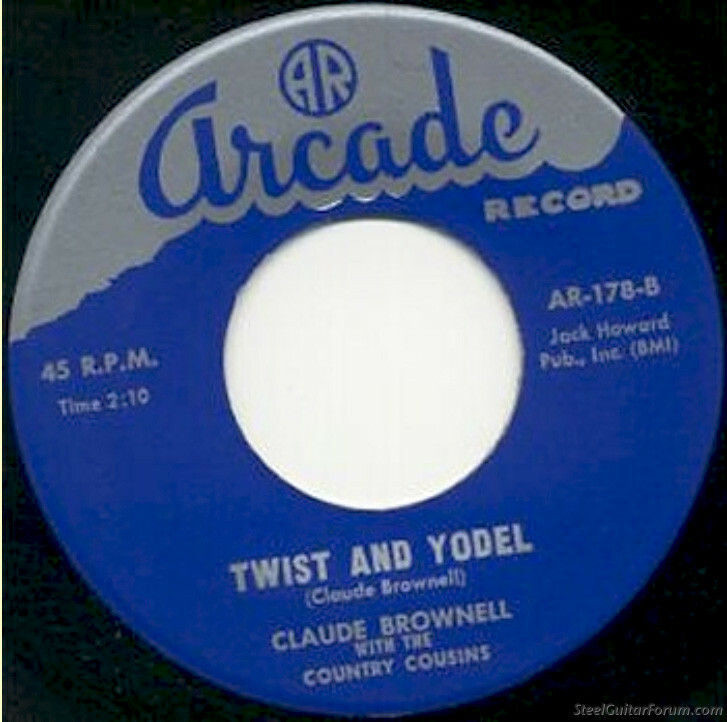 The Twist and Yodel was the B side. The A side was "Heartache Avenue" . Anyone have a link for that? On Hot Rod Daddy it sounds to me like Claude is doing the backup work behind the singer. The guitarist takes the break and claude is backing him up, and the vamp at the end is clearly the steel. If you were backing the yodeling trend in rock, I'd think you were in for an uphill battle. I really like the CD you linked to. I detect a Hawaiian influence, and I don't just think it's the C6 sound. I wonder if he like many others started out as a kid taking those Oahu or other popular method courses. Scott he studied directly under Eddie Alkire himself in Easton, PA. As Claude said here on the forum, he has played everyting Eddie wrote. 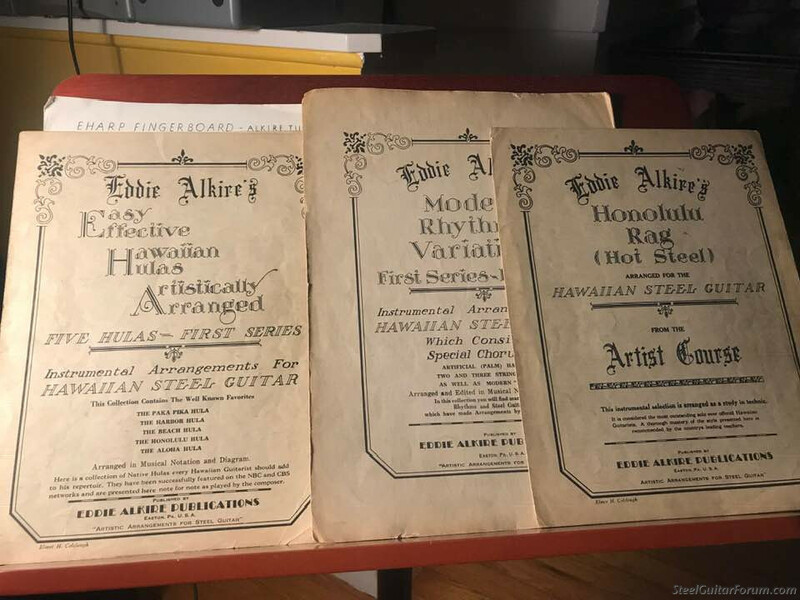 eddie wrote a multi volume “method” on playing the Eharp. Here is what is currently on my music stand. These are from the 30's. Oh right...gothca. I hope there will always be someone around who will carry the torch. That is some beautiful playing. Scott, I run an Eharp Players group on Facebook you are more then welcome to join. I moved from Austin Texas to Clewiston Florida in 1979(culture shock). Claude and Patti lived there or nearby. Claude did not seem interested in my pedal steel and I had never played lap steel so I didn't appreciate his lap playing. But, I did some gigs with him and Patti doing country and some Hawaiian. I played guitar and piano with them and even bought a small vibraphone to accompany the Hawaiian songs. Later, I saw him at the Florida Folk Festival and he had this older woman standing next to him. I asked if this was his mother. He said no, this was his wife. I have never ever been so embarrrassed!! Patti had died and he had remarried. I never had the pleasure of meeting Claude in person, merely admired him via cassette tapes. His touch highly reminds me of Bill Stafford's smooth awesome pedal styling. 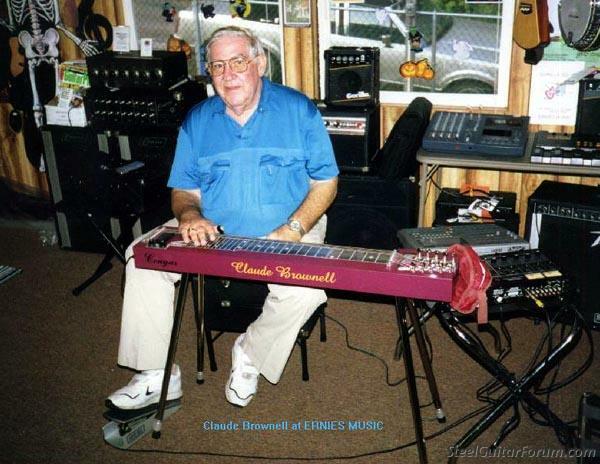 Claude mentioned to me he studied directly with the E-harp "inventor" Eddie Alkire. IMHO he far surpassed Eddie's style. It was a sad day when we lost such a fine talent. I think JB would have loved Claude's version of "Steeling the Blues"
found some more Claude Brownell "WAITING FOR MY BABY ( ROCK ROCK) - HAWKSHAW HAWKINS."